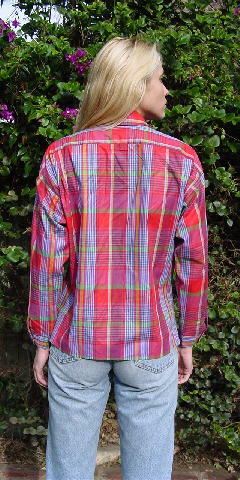 This vintage shirt is in a plaid pattern in red-orange, yellow-green, lime green, teal, black, and medium blue. 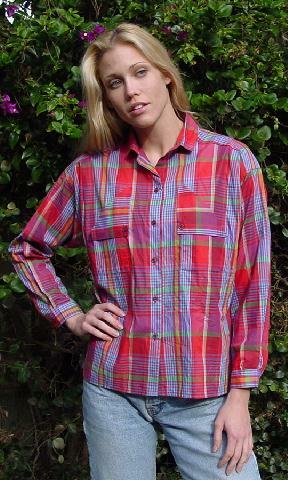 There are seven buttons down the front and two breast pockets with one-button crossover side flaps. The tag says it's size 10, but it fits like a size 8. The long sleeves have one-button cuffs. It was used in a magazine photo shoot on a ranch. The model wore vintage Wrangler jeans, an oversized leather belt, a vintage "well-loved" brown leather jacket and cowboy boots and a bandana tied around her head. shoulder to shoulder 20 1/2"
shoulder to end of sleeve 19 1/4"